Get Out and About On a Vermont Covered Bridges Driving Tour! 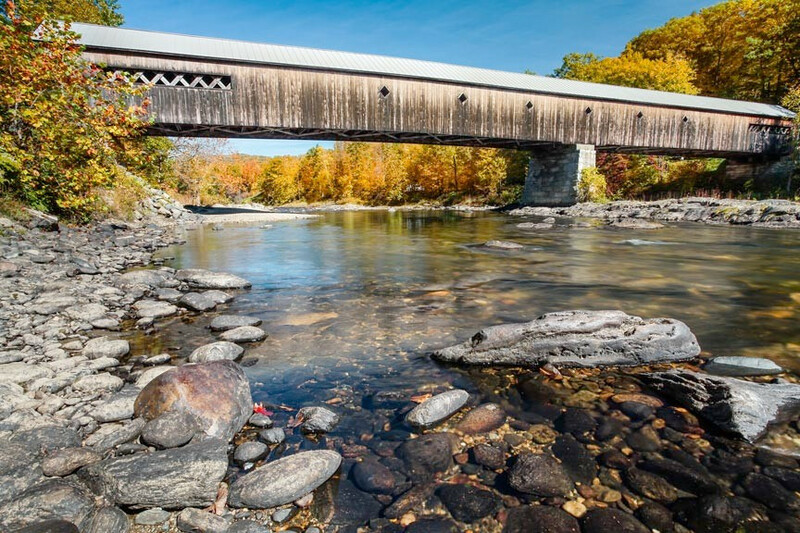 Vermont is known for its covered bridges, boasting more than 100 of them, big and small. The Woodstock area is no exception. Consequently, it’s very easy to plan out and enjoy a covered bridges driving tour with our Woodstock B&B as your home base! The covered bridges of Vermont are picturesque and often historic masterpieces of Yankee ingenuity. Their beauty naturally draws the eye – and the curious! Getting out on a covered bridges driving tour in Vermont is a wonderful way to spend the day and, in many parts of the state, incredibly easy, too. Woodstock, VT is not only surrounded by covered bridges, we even have a couple right here in town! As a result, we’ve created a list of covered bridges within an hour of our Vermont B&B. A list that includes the longest two-span covered bridge in the world: the Windsor-Cornish Bridge! Posted in Events and Attractions | Comments Off on Get Out and About On a Vermont Covered Bridges Driving Tour!